Grasses come in a variety of sizes and appearances. Grass comes in exotic flowering, native and weeping varieties. Uses include landscaping for restoration, reforestation and is used upscale landscaping projects. It's also harvested for wetland mitigation plantings and for wildlife refuge areas in the native forests. Over nine thousand versions of grasses, found in the Poaceae family, live on every continent on earth. Rather than tip based growing points, grasses' growth begins at the base of the plant or underground. Large root systems sustain grasses, allowing for rapid regrowth above ground. Grass stems contain nodes that produce leaves. Long and narrow, the leaf blade tapers to the tip. Small flowers, called spikelets, may sprout from some grasses and produce pollen. Carex is a sedge. The difference is that the stems of a sedge are stable while the stalks of grass are hollow in most species. Grass stems also have joints, while sedge stems don’t. Carex forms clumps and has the advantage over other ornamental grasses in that it does well in the shade, which makes it suitable for placing in a shady border or at the edge of a shaded path. The clumps are so dense that they discourage weeds. Carex pennsylvanica flowers very early in the spring. The plant contains both male and female flowers and does best in hardiness zones 3 to 9. It grows from six to 18 inches high and prefers moist, well-drained soil. Bulrush: Bulrushes also belong to the sedge family. There are about 150 species of bulrush. They like wet places and are an excellent plant to the area around a pond or water feature. Bulrushes grow from between one and 10 feet tall and have green or brown flowers, triangular stems, and long, thin, strap-like leaves. Like carex, they grow best in hardiness zones 3 to 9. 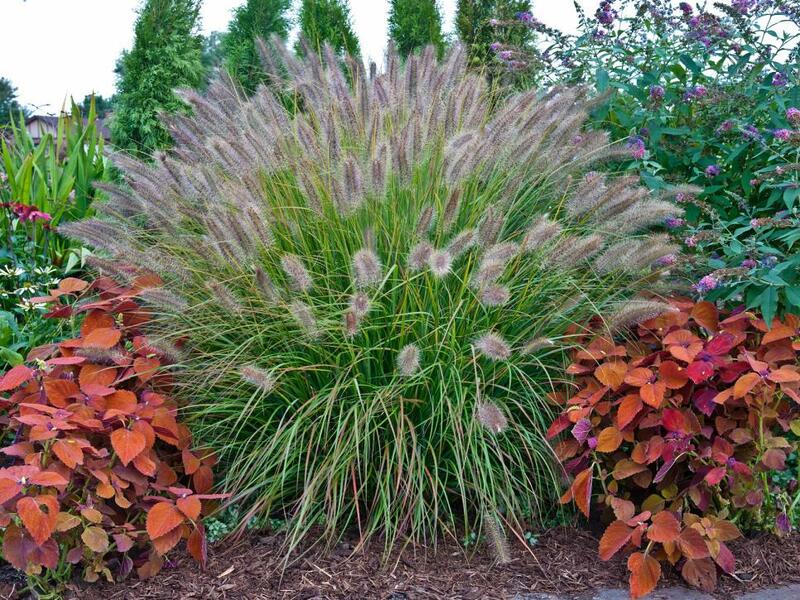 Miscanthus: This grass, also called Eulalia, is grown for its beautiful plumes and its height. It can grow to 10 feet tall, with narrow, three to four foot long leaves. The plumes last from summer until fall. This grass, which is, in fact, a member of the grass family, likes full sun and well-drained soil. Sometimes it is very hard to get grass to grow and especially when there is not enough water or rain to keep them moist as they are growing. Also, it is hard to water an entire area such as a field or larger area when wanting the grass to grow. There are many different grasses that will grow very well in drought conditions if they are necessary. Also planting these will be very easy because some of these are available in seedlings and with the right equipment they can be planted several at a time. During the year, there are times when areas will not receive as much rain as needed to help things to grow and become beautiful but with drought tolerant grasses they will grow very well. Some of the choices of these grasses are Brome Sedge, Appalachian Sedge, Monkey grass and Sawgrass. These varieties of grasses will also work splendid to create borders around flower beds, natural areas, sidewalks or driveways. The Sawgrass will grow to become several feet tall and works great in dry areas and will also grow well in moist areas. When wanting to cover a lawn or other large area Cherokee Sedge, Barnyard Sedge, Blue Joint Grass and Three seeded sedge will work great. These will look very natural in a large field and will look like they have been there forever as they begin to grow. These grasses are very little maintenance and will not need a lot of care to get them to grow, so they are great for homeowners or gardeners. These types of grasses can also be ordered in large or smaller quantities from online plant nurseries so a homeowner or gardener can order what they will need to complete a project. As long as these grasses have great sunlight and soils to grow in, and there is also some that will add a unique natural look to a gorgeous natural area when developing. This type of grass will grow just about anywhere which makes it an excellent choice for all homeowners looking for beautiful grass to add to lawns and garden areas. Grasses helps restore nature 100%. Environmentalists plant carex and other species to maintain a wetland and native habitat and also promotes wildlife and other type wild animals. These plants are extremely fast growers and will become full grown in a very short time. Some of them will grow to be inches tall as others grow to become several feet tall. There are some varieties that spread and cover large and small areas as they grow. They grow great in a variety of soils and love to be in full sunlight. There are also some that grows great in fully shaded areas.